Tape measures are indeed very important tools. "Measure it twice and cut it once" was a popular carpenter's saying Ross Perot used during his campaign for president in 1992. There are several types and sizes used in construction, but the Stanley 25' is perhaps the most popular. 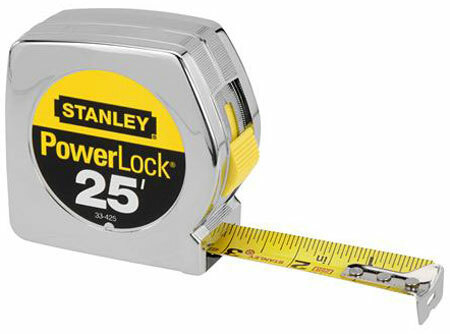 Stanley also makes a 30' PowerLock that has the same outside dimensions as the 25', but unless you can find a real need for the additional 5 feet, the price difference will sway you back to the 25 footer. While the 25' tape is the most commonly used, there are definitely reasons to own other types. I also own a 100' tape for measuring larger objects like slabs and foundations. As a carpenter on a typical construction project, you wouldn't use this type of measuring device every day, but it definitely has its purpose and worth adding to your tool box. I carry a more compact 12 footer in my glove box that I sometimes take into the hardware store to measure materials, etc. My wife carries a small 3' tape measure in her purse for measuring items she is thinking of purchasing for her craft projects. At the other end of the spectrum of measuring devices, there's the Sonin Ultrasonic Range Finder with laser and level. This distance measuring tool has a laser targeting system for accurate measuring up to 50 feet. Obviously, there are many types of measuring devices to choose from. I own or have used all of the measuring tools discussed in this article. While they are all very useful and best serve the purpose for which they were made, typically you will use the Stanley 25 footer most often. For that reason I chose it above the others to be on the myCarpentry list of essential carpentry tools.